As we move into the Autumn and the new school term has started, there is a feeling of expectancy, of new things to come, of all the seasonal festivals. Does it however feel like a new adventure or does it have that feeling of you being here too many times before?! Do you feel excited by all the coming events? Or can you really not be bothered.. a bit bored by it all? Energy Flows… Energy is all around us. Energy is us. Science continues to investigate, discover and map how it works. Our thoughts and emotions are also Energy, which we continuously process and form in our way into our lives. Energy naturally flows and evolves. The potential is always there for new opportunities, continual personal growth and wellbeing. Endings and beginnings naturally occur. But is this your experience? Unfortunately being humans with a great history of experiences, our energy does not innately flow with ease and we get stuck in patterns of behaviour and events which are not just ours but are fixed by society and the world at large; patterns which never end and new never seems to happen. It’s like living in a balloon that just sits around you, bobbing, unchanging and restricting who you are! Examples of these are religious and cultural beliefs, inequality between the sexes and other discriminations… we are all human, we all have a right to live a life that empowers each and every one of us but how do we do that in relationship with all around us? How do we support and interact with each other when we are all fearful of being hurt or humiliated? Want to Break Out of Your Balloon? 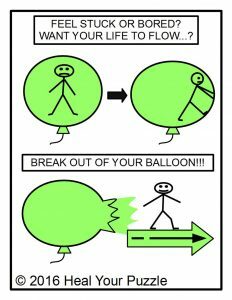 Sometimes it is not a conscious decision to want to move forward and flow with your Life, circumstances or challenges will present themselves at the right time for you to make you face your ballloon and find a way through and out; sometimes you just want to scream and shout at the balloon to “Get out of my way!! !” Some of you are on a fast track to change and you may find yourself facing balloon after balloon after balloon… layers and layers of stuck obselete ideas that you suddenly realise really don’t matter any more.